Eliana Burki (de) playing the alphorn at the Bardentreffen festival in Nuremberg 2009. For a long time, scholars believed that the alphorn had been derived from the Roman-Etruscan lituus, because of their resemblance in shape, and because of the word liti, meaning Alphorn in the dialect of Obwalden. There is no documented evidence for this theory, however, and, the word liti was probably borrowed from 16th–18th century writings in Latin, where the word lituus could describe various wind instruments, such as the horn, the crumhorn, or the cornett. 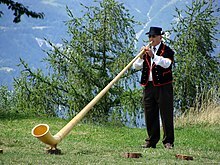 [clarification needed] Swiss naturalist Conrad Gesner used the words lituum alpinum for the first known detailed description of the alphorn in his De raris et admirandis herbis in 1555. The oldest known document using the German word Alphorn is a page from a 1527 account book from the former Cistercian abbey St. Urban near Pfaffnau mentioning the payment of two Batzen for an itinerant alphorn player from the Valais. 17th–19th century collections of alpine myths and legends suggest that alphorn-like instruments had frequently been used as signal instruments in village communities since medieval times or earlier, sometimes substituting for the lack of church bells. Surviving artifacts, dating back to as far as ca. AD 1400, include wooden labrophones in their stretched form, like the alphorn, or coiled versions, such as the "Büchel" and the "Allgäuisches Waldhorn" or "Ackerhorn". The alphorn's exact origins remain indeterminate, and the ubiquity of horn-like signal instruments in valleys throughout Europe may indicate a long history of cross influences regarding their construction and usage. The alphorn is carved from solid softwood, generally spruce but sometimes pine. In former times the alphorn maker would find a tree bent at the base in the shape of an alphorn, but modern makers piece the wood together at the base. A cup-shaped mouthpiece carved out of a block of hard wood is added and the instrument is complete. An alphorn made at Rigi-Kulm, Schwyz, and now in the Victoria and Albert Museum, measures 8 feet (2.4 m) in length and has a straight tube. The Swiss alphorn varies in shape according to the locality, being curved near the bell in the Bernese Oberland. Michael Praetorius mentions an alphorn-like instrument under the name of Hölzern Trummet (wooden trumpet) in Syntagma Musicum (Wittenberg, 1615–1619; Pl. VIII). The alphorn has no lateral openings and therefore gives the pure natural harmonic series of the open pipe. The notes of the natural harmonic series overlap, but do not exactly correspond, to notes found in the familiar chromatic scale in standard Western equal temperament. Most prominently within the alphorn's range, the 7th and 11th harmonics are particularly noticeable, because they fall between adjacent notes in the chromatic scale. Accomplished alphornists often command a range of nearly three octaves, consisting of the 2nd through the 16th notes of the harmonic series. The availability of the higher tones is due in part to the relatively small diameter of the bore of the mouthpiece and tubing in relation to the overall length of the horn. The well-known "Ranz des Vaches" (score; audio) is a traditional Swiss melody often heard on the alphorn. The song describes the time of bringing the cows to the high country at cheese making time. Rossini introduced the "Ranz des Vaches" into his masterpiece William Tell, along with many other delightful melodies scattered throughout the opera in vocal and instrumental parts that are well-suited to the alphorn. Brahms wrote to Clara Schumann that the inspiration for the dramatic entry of the horn in the introduction to the last movement of his First Symphony was an alphorn melody he heard while vacationing in the Rigi area of Switzerland. The military band of the French Chasseurs Alpins uses Alphorns. Begegnung for 3 alphorns and concert band, by Kurt Gable. The alphorn is prominently featured in television advertisements for Ricola cough drops, which are manufactured in Switzerland. ^ a b One or more of the preceding sentences incorporates text from a publication now in the public domain: Schlesinger, Kathleen (1911). "Alpenhorn, Alphorn" . In Chisholm, Hugh (ed.). Encyclopædia Britannica. 1 (11th ed.). Cambridge University Press. p. 723. ^ "Georg Friedrich Haas". Universal Edition. 1953-08-16. Retrieved 2016-12-28. ^ "EAM: Georg Friedrich Haas's Concerto Grosso No. 1 Debuts with Bavarian Radio Symphony Orchestra". Eamdc.com. 2014-02-25. Retrieved 2016-12-28. Wikimedia Commons has media related to Alphorn. This page was last edited on 30 March 2019, at 21:48 (UTC).